The Woodlands, Texas – Celebrate the music of rock legend David Bowie in this exhilarating musical tribute sponsored by Huntsman! 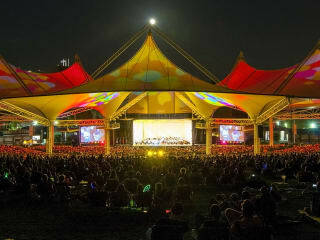 The Houston Symphony will return to The Pavilion Main Stage on Monday, July 16 for an evening honoring Bowie’s life and featuring a variety of his classic hits! Tickets for the 8 p.m. performance are $20 for reserved orchestra seating. Mezzanine and lawn seating are free. Gates open at 7 p.m. For more information, visit the Cynthia Woods Mitchell Pavilion web site.